The Papers of Aynsworth Pilson. The Aynsworth papers consist of seven manuscript volumes and one typescript copy of a volume, 1775-1863, comprising the records of Mr. Aynsworth Pilson of Downpatrick. 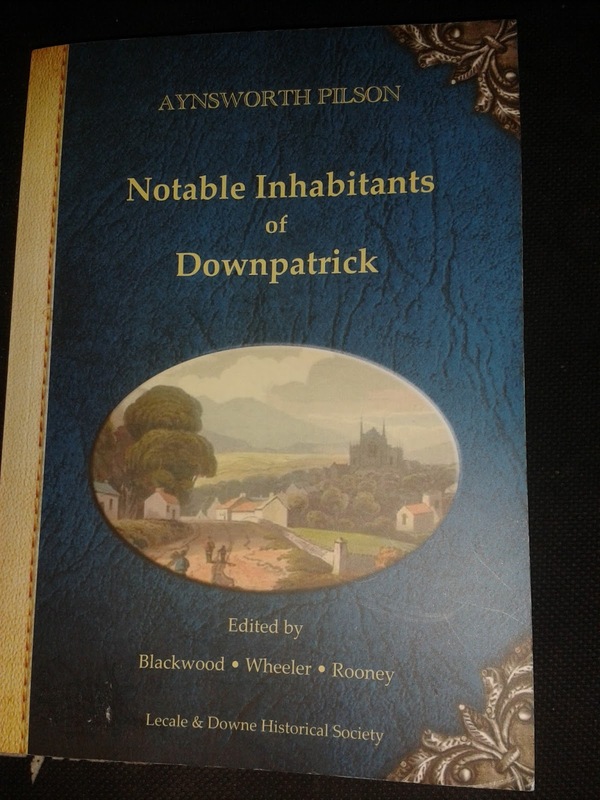 One of the volumes is merely an account book recording transactions, 1826-62, and another is entitled ''Memoirs of notable inhabitants of Downpatrick''. It provides much detail about 77 inhabitants of the town including Pilson himself who, we are told, had an income of £430 per annum by 1844. This probably had much to do with his father who had a distillery and tan yard which latter business he made over to his only son in whose hands it apparently prospered. In his early years, Aynsworth Pilson took part in public affairs, but he was not prepared to subordinate his private interests to them. Thus, after a connection of about twelve months with the Volunteers he resigned as he found he could not give sufficient attention to his tan yard. In later years he served on several local committees, such as Poor Law, and the Library. He seldom travelled far from home and consequently his diaries relate almost exclusively to his own private affairs and to those of Downpatrick and its neighbourhood. To people from that district Pilson's volumes should be of considerable interest. All the events, large and small, of a country town in the late eighteenth and early nineteenth centuries are noted. 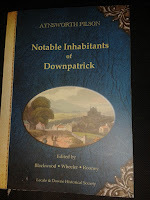 Lecale & Downe Historical Society has recently made available Pilson's seminal work 'NOTABLE INHABITANTS OF DOWNPATRICK' a uniquely detailed record of seventy seven local inhabitants of Downpatrick warts and all! Rev Humphrey Adams, William Becket. William Brewster Bingham MD, John Brett, George Buchanan MD, Rev Alexander Bullick, David Caddell, Richard Caddell, Hugh Cleland, John Craig, Rowland Craig snr & jnr, James Crawford, James Cumine, Rev John Dickson, Rev Arthur Forde, Theophilus Garner, George Gordon, James Gracey, Seneca Hadzor, Sydney Rowan Hamilton, James Hartwell, surgeon, John Hastings, William Hastings, Charles Stewart Hawthrone MP, Steel Hawthorne, Thomas Henry, Joseph Houghton, Edward Humphrey, Samuel Hunter, Samuel Johnston, surgeon, William Johnston, Rev James kelly, Rev Thomas Bailie Kennedy, Richard Keown, Busby Maclune, Patrick Maccartan, John Macoubrey, Rev Daniel Mathews, Alexander Miller, Rev James Nelosn, DD, Thomas Nevin, Thomas Parkinson, Aynsworth Pilson, Charles Pilson, snr & jnr, Conway Pilson, John Potter, James Quail, Henry Quin, MD, James Rentoul, John Richardson, John Rowan, William Charles Ruthven, Edward Southwell Ruthven, Edward Saul, John Saul, George Sharrock snr & jnr, William Hamilton Smyth MD, William Starkey, James Sweeny, William Thompson, Thomas Thompson, Rev Edward Trotter, DD, John Trotter, William Trotter, William Henry Trotter, Hugh Wallace, James Alexander Wallace, John Auchinleck Ward, William Waring, surgeon, Rev Ralph Wilde and Thomas Williamson. Pilson provides fascinating insights into many of the business and gentry men of the town many of whom he knew personally. This book is to be recommended as it provides a contemporary insight into the socio-economic workings of a small market town in the eighteenth and nineteenth centuries. Pilson pulls no punches. Since the original manuscript was a private document he could be scathing in his assessment as a contemporary witness to business life in the town, Below is his assessment of William Thompson who died in 1850 'after catching a cold brought on by a journey to Echlinville in Ards, which he had lately purchased and went to see on a very cold day and being wet with salt water crossing the River at Strangford'. Pilson records that 'during his long and parsimonious life (1766-1859) he had purchased twenty townlands in this county'. The history and circumstances of this extraordinary man’s extraordinary life affords matter of surprise rather than admiration or approval. He was truthfully a miser and a Sadducee, who could not have believed in a Resurrection. He toiled through eighty-four years , sixty-three of which were in prosecution of business on his own account, confining himself to the single object of acquisition of money. He cared not for his country, her prosperity or adversity were equally indifferent to him. His relatives looked upon him in no other light than as the future depositories of his accumulated wealth. Friends he had none. Politics he eschewed as touch when compared to his gold. Religion was equally subordinate in his estimation. He was not wicked; he was not dishonest, but like Faustus he had no leisure to discourse of righteousness and a judgement to come. His ambition was confined to one object, that of being the richest man. He would not have given a shilling for a ducal coronet. He filled no man’s belly; he covered no man’s back he flowers in no man’s path. Thankfully, Pilson is less scathing of most of his contemporaries covered in this interesting volume.